Foot levelers aim to improve your overall health, by supporting your foundation. The feet are the foundation of the body. They support you when you stand, walk, or run. Feet also help protect your spine, bones, and soft tissues from stress as you move. By stabilising and balancing your feet, Foot Levelers orthotics enhance your body’s performance and efficiency, reduce pain, and contribute to your total body wellness. These specialised orthotics have been clinically shown to complement your chiropractic treatment, when you stand, walk, and live your life in balance. Foot Leveler’s individually designed Stabilising Orthotics support the more than 26 bones, 33 joints, and more than 100 muscles, tendons and ligaments in your foot. 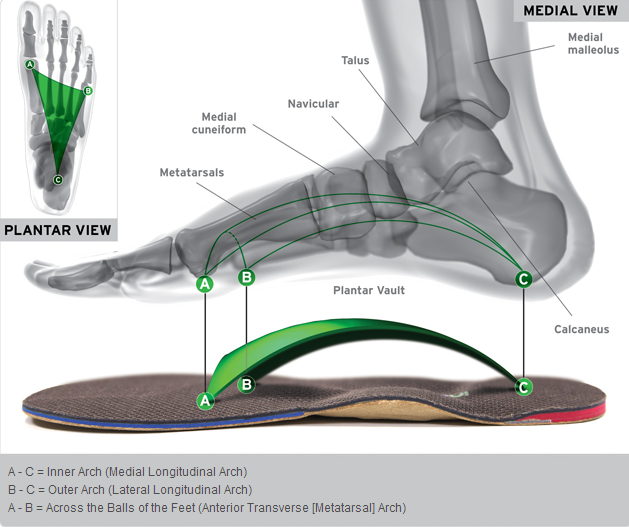 Stabilising Orthotics maintain the structure of the plantar vault to balance the entire body. Over-the-counter orthotics support only one arch in your foot. When only one arch is being supported the problem shifts to another part of your body. Foot Levelers Stabilising Orthotics focus on improving your overall health. They offer more than just short-term symptom relief.